If you’ve read Wish You Were Here, you’ll know that running away to America was my wildest fantasy when I was a kid. I never imagined I’d actually do it. Apart from anything less practical – how would I get my family to run away with me? My friend Carolyn Looby recently showed me (showed everyone, really, it was on Facebook) the awesome photo at the top of the page. 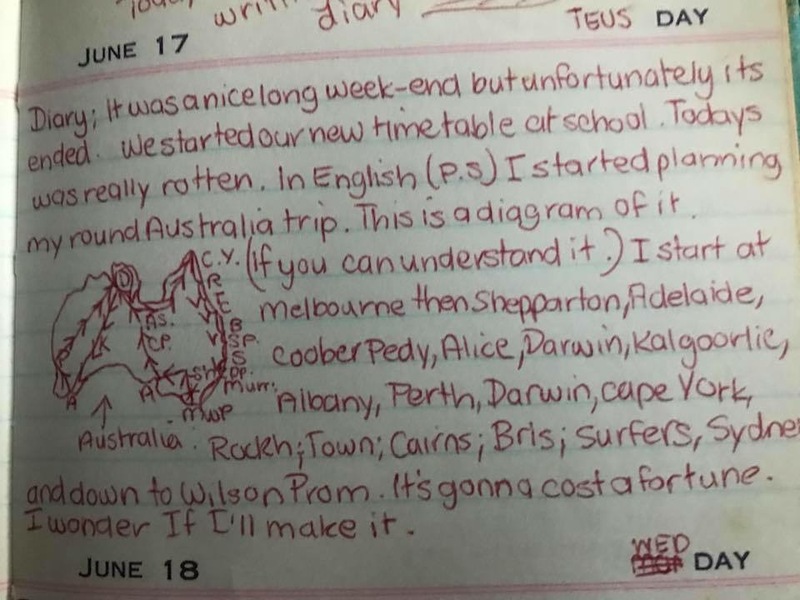 It’s from her diary when she was fourteen. Apart from her ambitious criss-cross through the middle, it’s pretty much the same trip I planned. Australia – girt by me! A hundred cities and towns in thirty days. It’s a book tour (sure it is) but more than that. It’s a connection and reconnection with people of the page. There’s a very particular relationship between the writer and the reader. It’s a rare one-to-one audience while the writer talks to the reader alone. And for a short period of time, the reader wears the writer’s brain and enters the world through their thoughts. I want to speak to that experience – as a writer, a reader and a reviewer. I plan to visit a library a day, and Instagram my progress. I also want to meet with a book club and talk to at least one bookseller each day. Basically, I’m reaching out to share the love of ideas and stories in the real world so we can share the unique experience of being bookish. I’ve mapped out my journey here: Interactive Book(ish) Tour. If you click through you’ll see where I’m going and when. As with life, one thing leads to another and it all leads back here if you want to follow my journey. This is the blog of my progress. Or would you like to hitch along for the ride? Particularly – do you know anyone who lives somewhere between Goondiwindi and Echuca? I’ve left my planning awfully late, but I’d love to stop in for a cup of tea and say hello! Leave a comment here (it will get to me personally) or come and find me on Facebook or Instagram or even Twitter if you can stand my mad rants.